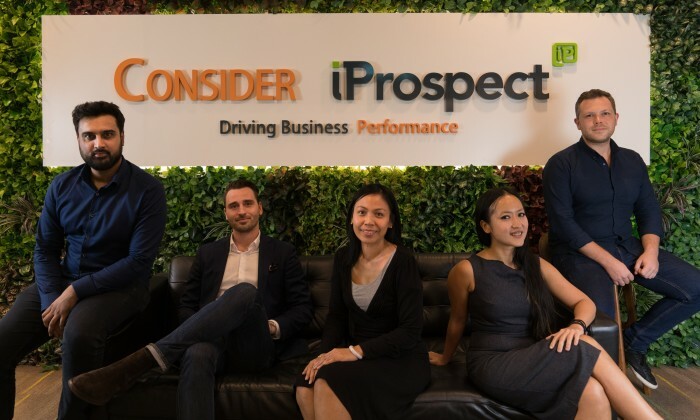 Consider iProspect, Dentsu Aegis Network (DAN) Malaysia’s flagship digital marketing agency, has made four senior hires in the last four months. It appointed Siti Raflise (pictured third from left) as chief data officer; Jeetinder Kahlon (pictured far left) as head of media; Filip Adamski (pictured far right) as head of e-commerce and Bee-Lee See (pictured second from right) as head of content. DAN Malaysia’s spokesperson said Siti Raflise, who was appointed in early December 2017, will be responsible for the agency’s data strategy, and spearhead its data-led consultancy projects. This also includes creating portfolio of products and solutions for its clients. She reports to Kasper Wandi (pictured second from left), CEO of Consider iProspect. Siti Raflise brings 19 years of experience in project management, business intelligence and customer insights. Previously, her roles included head of insights for Taylor’s education group, sales and operations director of Arte 38, and global market research manager for Microsoft EMEA. Meanwhile, head of media Kahlon, is tasked to manage client’s media strategy and paid media performance. Kahlon brings in-depth experience in both online and offline channels from five agencies across London over the last 10 years. He has implemented media systems and processes to improve the efficiencies of agencies and clients alike. Prior to joining Consider iProspect, he was the group head of media and analytics at Lion & Lion, where he managed a team of more than 20 professionals and oversaw all digital media strategies and business development. Adamski rejoined Consider iProspect to accelerate digital transformation for companies through e-commerce opportunities. Adamski was part of the original Consider Digital (before the agency was acquired in 2015 by DAN) when it was only a 10-staff agency. He was the senior account manager for P1 and Estee Lauder. Then he returned to Poland, a country where 50% of sales takes place online, where he took on the head of marketing role for one of the largest e-commerce players in Europe. Lastly, See who is head of content, is responsible for working closely with brands to craft and implement holistic content strategies across all channels. See joined Consider iProspect from Malaysia Airlines, where she was the senior marketing manager and head of content. She brings in 18 years of experience, from varied functions including corporate communications, marketing and publishing, business development and budget and control. All three of them report to Andrew Turner, chief business officer at Consider iProspect. “The industry is moving in breakneck speed that if you snooze you lose, and one key component in ensuring we stay ahead is the talent we have,” Wandi said, adding talent is its most important asset. “Apart from the head of content role, the rest are newly created positions, a strong indication of where we see the potentials and growth opportunities are to take our business to the next level,” he added. To drive McDelivery orders this World Cup season, McDonald’s, OMD Hong Kong and Google will partner up to reach excited football f..
À La Carte Productions, a division of Peter Knipp Holdings, has appointed HEAT branding as the official Public Relations agency of..
Mediacorp states Toggle staff were not present at the filming of the video. ..